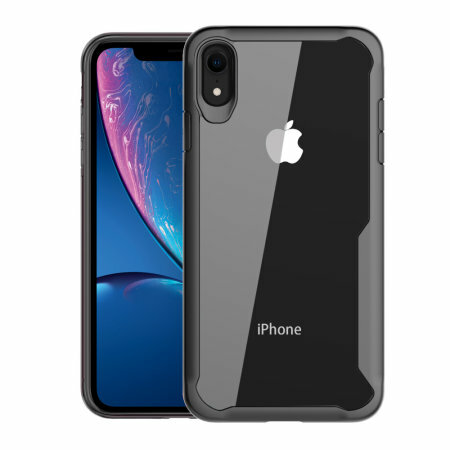 Perfect for iPhone XR owners looking to provide exquisite protection that won't compromise iPhone XR's sleek design, the NovaShield from Olixar combines the perfect level of protection in a sleek and clear bumper package. Good fit for the phone. Not too heavy and does what it says it does. Got to say I’m happy. This is my second case on my iphone XR. Initially, I thought the case increased the size of the phone by 2 or 3 mm. This is where I liked my previous ultra thin case (Olixar Ultra-Thin iPhone XR Case - 100% Clear). However, the phone does not slip out of the cover of the Olixar NovaShield (which was a problem with previous one) and has a solid feel of protection. Therefore, I have now got used to the increased size and enjoying the confidence and lightness. I am so thankful to MobileFun to guide and offer me the correct case. This phone case is awesome. Love it. Ordered this case for a new iPhone XR, so wanted something that would really protect my new toy but not detract from the appearance. Bought it together with the oligarchs tempered glass screen protector and both combined look really good as well as protecting from bumps and scrapes. Would definitely recommend. Really impressed with this case. Protects the phone well, doesn’t make it look too bulky. Also, the true depth camera on the back is protected as it sticks out a bit without a case. Exactly what I was looking for. Slim fit but still providing excellent protection to the phone. If you place the phone on it’s front or back there is just enough of the case to protect ithe glass front or rear camera. Also a superb price. Thank you. The bumper is slightly raised by about 1mm around the edge which I like because it should stop the screen getting scratched if I move the phone around on the desk. The silence switch on the side is easy to reach, you don't need long fingernails to use it. With the clear back I can still see the apple logo. What I like is that the camera lens is protected by an ever so slightly raised edge around the camera. On the bottom the speaker grilles and the charging port are all unobstructed. The bumper has a smooth but slightly textured feel which makes it a little more easier to grip. There is no annoying brand logo on the case. Quite a relief as I wasn't sure from the photos.